I think this crop of the previous image is much stronger than the original composition. Using new Real Watercolor in Painter 12. Hi Skip, OMG that pink tree is absolutely beautiful, well done to you. I love love it! If your’e teaching that method anytme soon plz let me know? Thank you very much. So glad you like it. I do plan to have another watercolor class, soon…I just have to get off my duff and get it done. I keep thinking about it….. I need to practise Watercolour and go where I’m affraid…..Considering I have relinquished my fear of Divorce, I can conquer anything…..and eeeek my way up black mountain….. I attended my first Painter webinar yesterday, and was overwhelmed at the choices, let alone your ability to let your muse lead you around the canvas. One question: Do you have an outlet for your art for purchase? A friend on FB asked, after seeing your work via my timeline. I could not find a link here or doing a search. 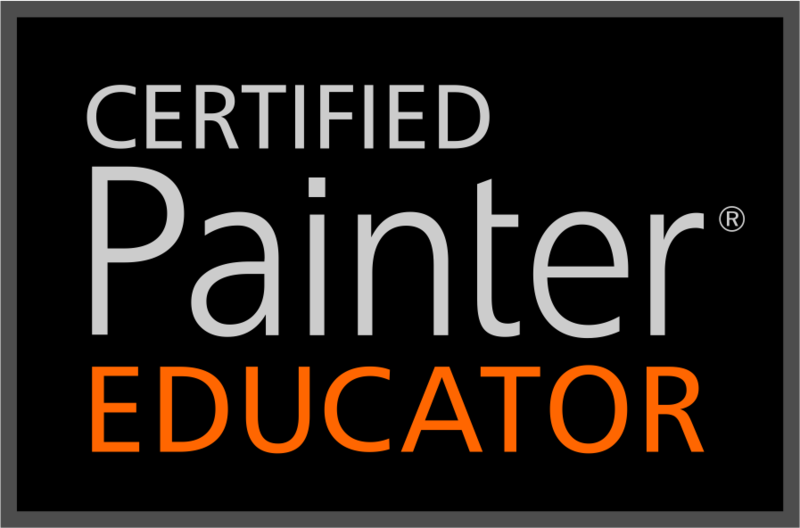 Thanks for answering and all your efforts to help those of us just starting to explore Painter and the art of painting. I am so sorry. I missed your comment and just discovered it. I don’t sell my work, but thanks for asking. Again, I am so sorry to have missed your comment. I hope you will continue to visit. I posted on some of the pictures, but follwed from the Corel Painter group to the tutorial from Tim Shelbourne and sent the link to our Digital Nuts group. I am hoping everyone gets a chance to play with the brushes and learn from you both! I told them your knowledge of the mechanics of Painter is way over my head but I take what I can understand and use it in my art! I was part of Digital Nuts, but had to stop because my time just didn’t permit participating. Even though I didn’t participate, I enjoyed seeing what folks were doing. I noticed and was grateful that you posted links from my site a couple of times before. Thank you so much and maybe some of the group will follow the blog. Your work truly inspires me, wish you long and joyful painting, but I guess you already have that. I have just found your tutorials and website but already learnt lots of useful things. I do have Corel Painter X3 and I love it. I find it much more stable than Painter 12, plus I like the new features. Brushes are forward compatible, but not backward compatible. In other words, if I create a brush in X3, it will not work in Painter 12, 11, X etc. But any brushes created in Painter 12, 11, X etc will work fine in X3…so if you do upgrade to X3 all of my current brushes will work. Thank you for your answer. Just one more question: does brush installlment work in X3 like you describe it in 12? Yes…download my brushes as a .brushcategory or .brushlibrary file and you can import them directly into X3. I love your watercolor island scene featured in the X3 Reviewer’s Guide. Thanks for telling me that. I had to go find the review; I hadn’t seen it so was unsure what image you were talking about. I need to try to do some more images like that. Flow maps work very well with those types of images with big skies. Gosh…that image isn’t in my gallery. I’ll have to add it. Thanks again Eden. How can I find out your signature ? I am bad about not signing work, but to be honest, it is very doubtful it would be something from me. The only watercolors I ever sold were traditional ones back from my art school days. They would be signed Skip or Skip Allen. I wouldn’t have used just “Allen.” I hope you find the right artist. I appreciate your comment…thanks for stopping by and taking the time to comment. you have a truly beautiful watercolor gallery, Skip! I particularly love your landscapes with this technique. Dear Skip, Your gallery is unbelievably gorgeous. Thank you for all you do. I just got out of the hospital and 12/22 and still recuperating…thank God for laptops. My brother dies on 11/20 and my dilemma began on Thanksgiving night. In the meantime do have a fabulous Christmas. You are in my prayers and thoughts. I am so sorry to hear about your brother. I am with my sister in Mississippi. She is a stroke victim and I am her only family. She is trying to live alone against all medical advice. I am worried for her, but she steadfastly refuses to come to GA or move to an Assisted living facility. I hope you had a wonderful Christmas and your New Year will be bright, happy and healthy. You are an inspiration. Prayers to you both at this holiday time! Why does it seem more difficult at this time like it is without my mom after passing last year? I guess it must be the memories but kind hearted people like skip keep my heart on beat that it is all a blessing to see what new and wonderous things await us not just the memories of times past which we long to touch once more. Thank you so much, Tanya. Prayers to you also. May you and your family have a blessed, happy, healthy new year. I just downloaded some of your brushes and they look like so much fun to play with…I’m going right now and trying them out! Thank-you so much! You are very welcome. I hope you have loads of fun. Hello Mr. Skip. I just bought a new tablet and Painter 2017. I used to do water colors and am totally excited to give it a try in digital. I found your tutorial super informative and inspiring. Thank you.